Your fur babies may feel unsure about their new environment, which can lead to behavior issues that were not a problem in the past. Some pets will absorb their caregivers' emotions: if you feel anxious, they may be jumpy and extra-sensitive; if you feel scattered and chaotic, they may feel insecure. They may become focused on establishing their "territory" in their new home, or they may want to stay under the bed or in their crate and hide. Thankfully, there are easy things you can do that can help make the transition a bit smoother - for everyone involved. Keep your routine schedule for feeding, walks, playtime, cuddling and bedtime. If a dog is used to using a doggy door, set one up in your new place. If your cat is accustomed to outdoor time, arrange for that — even if you have to use a leash initially for safety purposes and to keep him from running away. You may be tempted to get your pet new accoutrements, but this is not a good time to introduce new items. Instead, bring your pet's favorite bed, crate, toys, food and water dishes, treats and other familiar items. Put them in similar places as they were in your previous home. Favorites will help your pet feel in control and at home more quickly. Think of ways to ease your pet's transition. Some animals will feel best being near you no matter what you're doing. Others will do better in a crate away from the moving madness. Or perhaps it's better for your animal buddy to stay at a friend or family member's home during the actual move; joining you once you've unpacked. The more secure they feel, the better they'll weather the change. During the packing stage, the actual move and the transition in the new home, plan for your pet's safety. Some animals will be upset and scared once the boxes and suitcases take over. They may hide or run away. Set aside a safe place where they can't get lost or hurt. 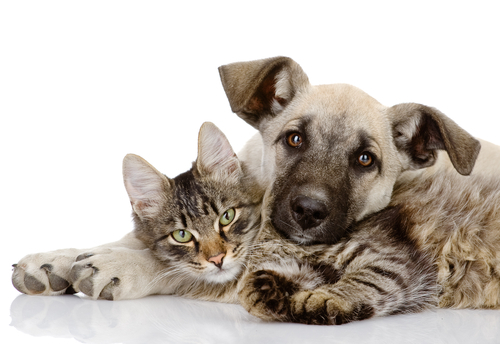 Make sure your pet has identification and your contact information, and that you have copies of veterinarian records. Learn about any aggressive animals in the neighborhood, or any structural risks in the home or yard. Allow your pets to take their time sniffing around their new digs. Let them explore — and if they decide to hide for a while, that's OK as long as they know where the doggy door or litter box is. Allow them to come out when they are ready. Their behavior may change for awhile, including eating and "potty" habits, barking, pacing or protection behaviors. They need time to get used to their new home, just as you do. Give your pet the attention he is used to. A bit of extra loving will go a long way as they come to feel at home in their new surroundings. Remember that difficult behaviors are a result of their discomfort with the change and a sense of not feeling in control. Difficult behaviors don't mean the pet is bad and can't change. Get help from a professional trainer or veterinarian if your pet's difficult behaviors persist, and remember all the unconditional love they give you. It's going to take you a while to settle into your new home. Similarly, it's going to take your pets some time to adjust as well. But doing some of the above things can help make that transition time a bit smoother.